The Indiana Window Tint Law is a very good one but is different than our neighboring states and allows for a medical exemption too. This page helps explain it for you. Keeps too dark of film from being applied and causing the driver difficulty in seeing during hazardous conditions - night time driving, rain storms, fog, etc. Will I or my loved ones be at risk for a ticket? It's possible. Some municipalities focus their attention on illegally tinted vehicles for more traffic stops as they are an easy target. Nothing screams "come and get me copper" than a hot car with really dark window tinting. Its like waving a red flag in front of a charging bull. NOT a good idea. 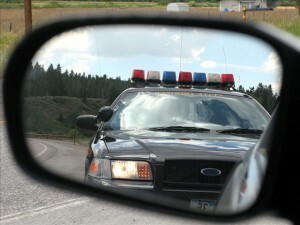 "I've had dark tint on my cars for years and I have never been pulled over even once." All we can say here is "Good for you!" But increasing indications point to the fact that the party may be over soon for people who insist on driving their cars with extremely dark (illegal) tinted windows. As state and local governments become increasingly strapped for revenue (moolah, cash, green backs) to pay for their bills, writing tickets for illegal window tinting becomes more attractive - and easy to spot. The fines can be extreme too, especially if you try to fight it in court and lose. Even the fine that is attached to the ticket is higher than you probably think. There is also the possibility of losing points on your license. So, why risk it? Darkness of tint is measured by Visible Light Transmission percentage (VLT%). In Indiana, this percentage refers to percentage of visible light allowed in the window. Front Side Windows - Must allow 30% of light in. Back Side Windows - Must allow 30% of light in. Rear Window - Must allow 30% of light in. The statute allows for individuals with a medical condition - sun sensitive eyes, Lasik surgery patients, those with skin cancers, cataracts, or Lupus - to be exempt from the law. This represents our current understanding of the current Indiana Law on window tinting and should not be relied upon solely as an absolute rendering of the law. DT Services Window Tinting LLC is not responsible for inaccuracies found in the above information and is not liable for incorrect understanding of the above information contained on this page. Please consult an attorney if you want the most complete and accurate understanding of the Indiana Window Tint Law.